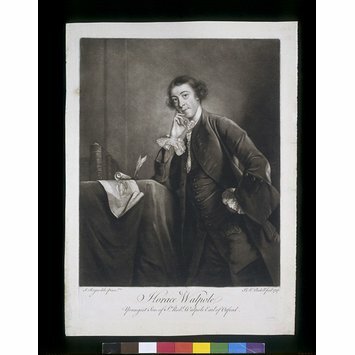 Horace Walpole (1717-1797), the youngest son of Sir Robert Walpole, Britain’s first Prime Minister, was a gentleman of many talents—antiquarian, politician, writer, historian, social commentator and avid collector (Fig. 1). His passion for collecting art and objects of historical significance started at an early age: when he was only 23 he spent two years in Italy and France on the Grand Tour. To document his travels he acquired souvenirs, bringing home to London a collection of carved ivory heads representing classical and biblical figures. Upon his return, he commissioned the cabinetmaker William Hallet to create a hanging cabinet to display the ivories. 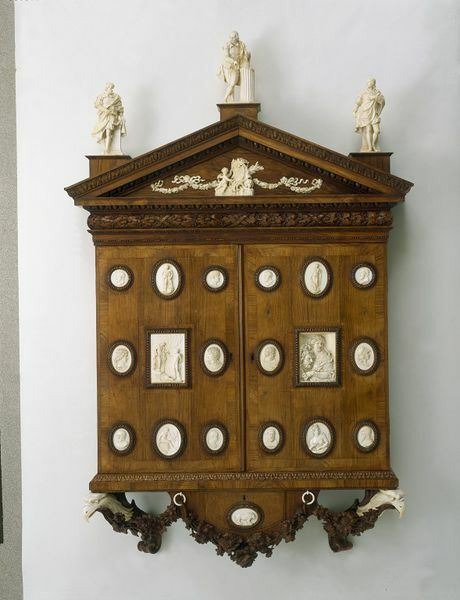 The carvings were attached to the fronts of the two cabinet doors, while the inside was used to hang a collection of portrait miniatures (Fig. 2). 1 This cabinet would be the start of Walpole’s life-long passion for preserving and displaying objects of art. Although Walpole was born in London, he spent much of his adult life living on the outskirts of town in Twickenham, in his Gothic Revival mansion, ‘Strawberry Hill’. From 1748 to 1790, Walpole rebuilt, altered and added to Strawberry Hill, increasing its original five acres to 46 and significantly expanding the number of rooms throughout the house. 2 Walpole based the designs for his home on aspects of various Gothic buildings, but took liberties with the original style in order to suite his needs and desires. He collaborated with a small group of close friends (known as the ‘Strawberry Committee’) on the designs for the house. Their alliance resulted in a magnificent Gothic Revival structure, which not only acted as Walpole’s home, but also served as a museum to house his ever-expanding collection of objects (Fig. 3). Walpole opened his impressive home to the public and visitors were allowed to visit the rooms by ticketed entry, viewing the varied collection displayed throughout. In order to organise and document the multitude of items in his collection (which numbered more than 4,000), Walpole wrote his own catalogue titledA Description of the Villa of Mr. Horace Walpole, which was published in 1774 by his own publishing house The Strawberry Hill Press. The catalogue was even updated and republished in a second edition in 1784. 3 Walpole also created a list of Principal Curiosities, which highlighted what he thought were the best pieces in his collection. Walpole included his personal opinions about his objects and any knowledge or historical information he had on a piece within his catalogue descriptions. It is evident from his writings that his information was not always accurate, but the documentation of objects—such as the recording of provenance or where an item was displayed within Strawberry Hill—was paramount to Walpole. Among the many treasures Walpole collected and displayed at Strawberry Hill were items dating from ancient to modern times and pieces ranging from curiosities, antiques and works of fine and decorative art. Objects on view included: Old Masters paintings, drawings, sculpture, coins, silver, ceramics, furniture, written journals and portrait miniatures, to name just a few. He was particularly interested in British history, placing specific importance on English kings, royal marriages and items that told a story. A wonderful example of these themes in his collection was a gilt-metal clock rumoured to have been a gift to Anne Boleyn from Henry VIII upon their marriage in 1532. Engraved with the initials “H” and “A” and the words “The Most Happye”, it served as a beautiful relic of a tragic and brief royal romance. Queen Victoria purchased this clock in 1842 and remains in the Royal Collection (Fig. 4). Of equal importance to Walpole were ceramics—ranging from ancient to modern—and portrait miniatures. These two categories were personal favourites of his and he dedicated much of his collecting efforts to acquiring substantial amounts of both. This pursuit resulted in the largest and most versatile collections of these two mediums in England. Walpole’s exceptional ceramic and miniature collections are only two of several accomplishments on which he should be commended. A set of engraver’s notebooks in his collection inspired him to write Anecdotes of Painting in England, a four-volume set published by Strawberry Hill Press between 1762 and 1780. This set became the first published history of English art and Walpole’s inclusion of in-depth information on portrait miniatures established these tiny artefacts as a legitimate art form for the first time. At the end of the sale, Walpole’s vast collection had been scattered amongst collectors, museums, libraries and dealers. An effort is currently underway by the American Walpole scholar, Wilmarth Sheldon Lewis, and the Lewis Walpole Library at Yale University to locate and document all of the dispersed items from Walpole’s collection (www.library.yale.edu/walpole). Strawberry Hill House has now undergone extensive refurbishment and is open to the public (www.strawberryhillhouse.org.uk) (Fig. 6). Although the rooms are predominately empty, visitors can walk in the footsteps of the 18th century visitor, marvelling at the Gothic architecture and impressive surroundings which once provided the backdrop for Walpole’s collection. Although some have viewed Walpole as an eccentric whose obsessive collecting habits resulted in a mass of valueless trinkets, this opinion seems to overlook the contributions that he made to the history of collecting. Walpole recognised the value of objects and art and the importance of preserving their history for future generations long before the institution of the ‘museum’ became commonplace. He found enjoyment in acquiring items he felt were beautiful or historically significant and his willingness to share this with others resulted in a home that was part dwelling, part study in architecture and part museum. His contributions to the study of art and history did not end there, but reached further through his writings—both about his own collection and on art in general. Horace Walpole’s passion and forethought continue to inspire the collector in all of us, some 200 year later. Although she has training in all areas of art history, Lisa Daniels's specialty is 18th, 19th and early 20th century English and American furniture and interiors. For her Master's thesis, she extensively researched the furniture and interior designs of Rhoda and Agnes Garrett and published an article based on her findings in The Decorative Arts Society Journal #35 in 2011. As a freelance writer, Lisa continues to research and write on various topics of interest, particularly those pertaining to the history of the decorative arts.